I must have bad luck with graphics cards. 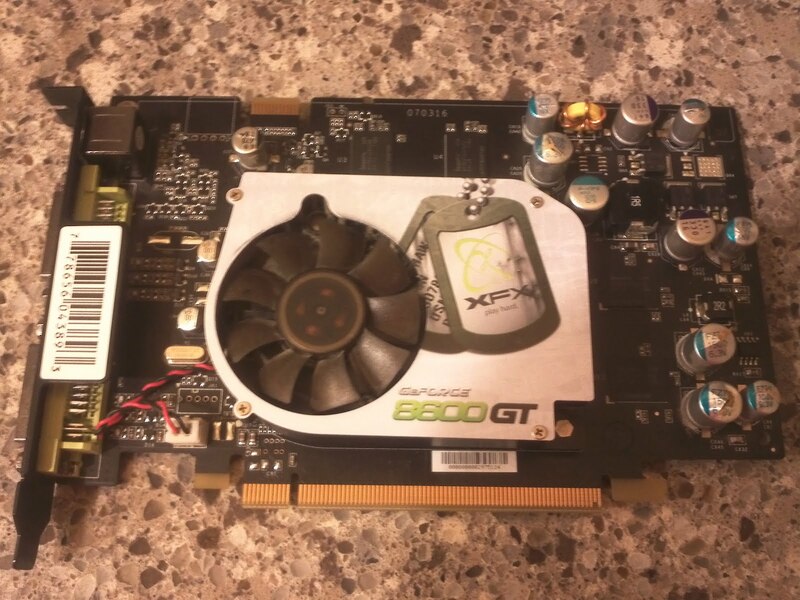 My last graphics card was an XFX nVidia 8600GT. My current graphics card is an EVGA nVidia 9800GT. Both have failed in unexpected ways. Fortunately, I have been able to fix both of them! WARNING - these procedures will most like void the warranty, if you have one. One evening I was sitting watching TV in another room with my wife. We heard some 'pop' noises. Well, more like several loud 'cracks'. My wife asked me what the sound was. I thought it was the ice maker in our fridge. Suspiciously, though, the graphics on my computer started having problems. I began seeing artifacts here and there. Then, more pops and the display become incredibly garbled and unusable. I pulled out the graphics card and what you see above is what faced me. 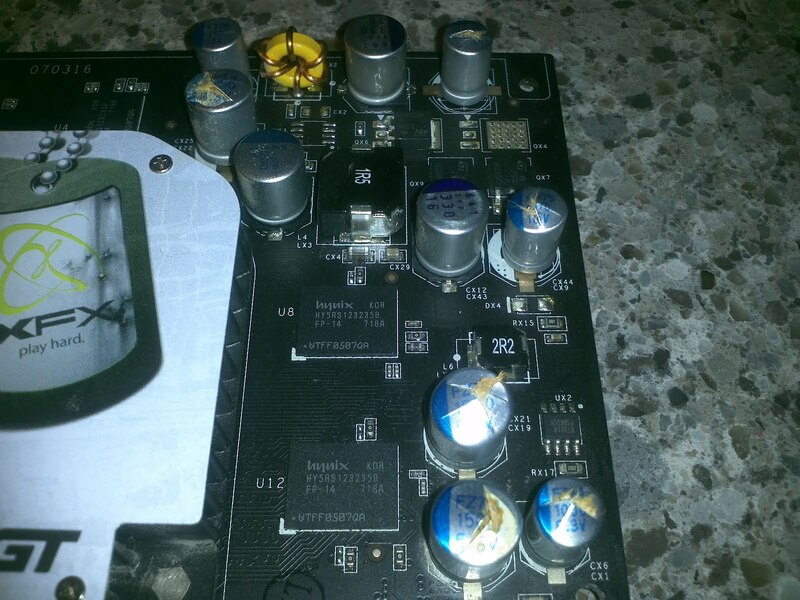 Numerous aluminum electrolytic capacitors had exploded. You can see the paper separator(the yellow fibrous stuff) spewing out. To fix the 8600, I purchased some aluminum electrolytic capacitors from Digikey with the same values as the exploded ones. Generally, caps that large have their values and ratings printed on them. I needed some 1500uF 6.3V, 1000uF 6.3V, and 470uF 16V capacitors. The footprints for the capacitors were generic and supported multiple sizes, so I just got the cheapest ones in approximately the same size. Radial capacitors have 3 dimensions to consider. Lead spacing, diameter, and height. In retrospect, the replacement 1500uF caps are a lot taller than the original, but they still fit in my case. I wouldn't worry about stressing too much about matching ESR or any other features other than capacitance and voltage rating. Odds are that the originals are on the cheaper side. I busted out my heat gun, and replaced the exploded caps with new comparable ones. Using my heat gun (a $25 Amazon special) and some patience, I pulled the old caps and immediately slid the new cap in the empty holes, noting polarity. I used the heat gun to keep the solder molten while putting the new caps in place. I touched up the leads with some fresh solder using my soldering iron and trimmed them with some diagonal flush cutters. Here is the finished product compared to the original. I may post a video tutorial of the fix. I am currently typing this post out using the 8600 with the replaced caps. It seems to be working flawlessly. I even successfully stress tested it with my favorite graphics intensive video game. My newer card, the EVGA 9800GT failed after about 18 months of use. While I was at work, apparently the computer started making a bad rubbing sound. I was not notified of the sudden change, and noticed that it was slightly louder than before. I tried to open my favorite video game only to be disappointed by the graphics performance. Suspicious of the louder than normal fan noises, I downloaded a hardware monitoring program and discovered my GPU core was at 99C! Burning hot! I quickly shutdown my computer, opened it up, and pulled out the graphics card. I removed the fan with molded airflow director from the heatsink. Upon discovering the sticker was loose, I remove it to find something surprising. The molded impeller body had cracked in half! Woah! Is that the San Andreas fault?! To fix the cracked impeller body, I simply got out my superglue with a brush applicator, and carefully applied some superglue in the crack and on the metal body of the fan where the molded plastic impeller body is mounted. I applied some pressure to keep the halves together, and voila! The fan was fixed. The fan now operates correctly and the GPU core sits around a much more comfortable 45C under use. Sacon FZ capacitors........normal for those to explode. Yo. Tell me that this video adapter... STILL works! I have trouble finding exact replacement aluminium LOW- ECR capacitors on our market, so I decided to put cheap NON-ECR replacement capacitors - just like you did. Will the video adapter work after this repair and how long? Sorry, somehow your comment got spammed in my email so I didn't see it until now. Yup, both graphics cards still work GREAT! I'm not sure by what you mean by NON-ECR, but if they have a higher ECR than the stock caps, you might just see artifacts due to noise. That would only happen if you are unlucky. If it works, it should work for awhile. The moral experts conduct this test by replicating a cyber attack on the network in order to understand how strong it is against any network intrusion.